Almost all creative and intellectual work is protected by copyright and enjoys copyright protection. Remember that facts, ideas, and processes are not subject to copyright. Creative and intellectual works do not have to have a copyright notice posted or be registered in any way in order to receive copyright protection. This means that everything from a novel to a napkin doodle has full and automatic copyright protections. Works are protected for the life of the author, plus seventy years. If a work was “made for hire [pdf]” it is protected for 95 years from publication or 120 years from the creation of the work (whichever is less). The rules are different for works made before 1978 and are incredibly complicated. 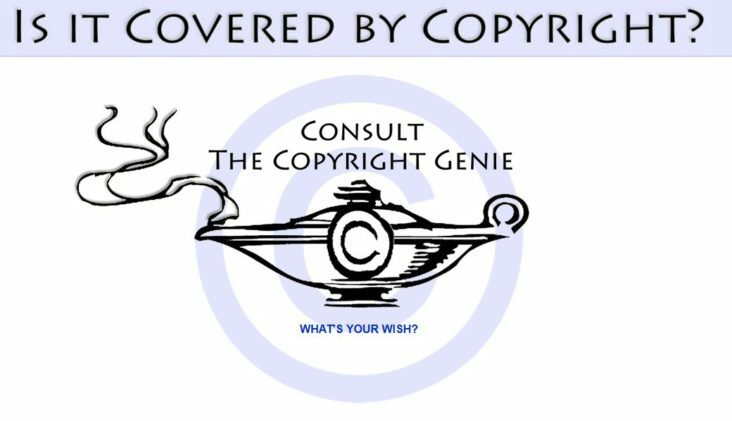 Try this copyright slider from the Copyright Advisory Network when in doubt. Works with expired copyright pass into the public domain and are available to be used in whatever way you’d like. Works created by the US government (and some states), facts, ideas, and processes are not protected by copyright. A good general rule: When in doubt, assume that a work is under copyright and seek appropriate permissions. Because these rights are imagined as a bundle, the owner of the copyright can give away, sell, or otherwise license some or all of these rights to others (e.g., when an author negotiates a contract, s/he may give the publisher the right to copy and distribute the work but not to make future derivative works, for instance). This list encompasses most kinds of creative or intellectual expression. Works must also be "fixed in a tangible medium of expression" in order to be subject to copyright protection. Unfixed works like improvised music, speeches, or dances are not protected by copyright. This tool will help demystify questions regarding when items are protected by copyright. Run questionable items by a copyright expert. CLICK on the image below to begin! All College employees and students are required to comply with the Federal Copyright Act of 1976, as amended, 17 U.S.C. 101 et seq., in all activities related to instruction, research and study at the College. The College will maintain procedures and guidelines to assist employees and students with the understanding the parameters of such compliance. Any employee or student who violates the Copyright Act is solely liable for such action. This link provides helpful information about obtaining permission to use copyrighted materials. This link provides information about how to file a complaint regarding copyright infringement at McHenry County College. This link provides detailed information about Title 17 of the U.S. Code.